Thanks to Hal-9000 and Amazon’s Alexa, most know what a “chatbot” is. However, many don’t know how conversational computer programs work. Computer Science students from the University at Albany’s College of Engineering and Applied Science (CEAS) started to understand how the technology works by building their own chatbot through CTG UAlbany’s Student Technology Innovations Lab Experience (STILE) this summer. “This is the kind of project that pushes you to think differently and apply what you learn in the classroom in a practical setting. I have enjoyed the challenge,” said Rutuja Shah who is in the Computer Science masters program in CEAS. She has led the chatbot development throughout this summer. “This work has also prepared me to go into the workforce with something to show potential employers,” Shah said. After building the chatbot digitally with publicly available computer code, Shah trained it how to respond to common questions and interact with customers through publicly available datasets. Essentially, the chatbot was guided to “read,” thousands of conversations and responses and learned how to respond appropriately and quickly. She presented her progress to CTG UAlbany experts throughout the summer. “It has been an intriguing experience to become immersed in a real-world project. These are the kinds of projects that present problems that need to be solved that you can’t anticipate in regular classes. And I needed much more than just technical skills. I needed to work in a team environment and present my findings in a public forum. It was nerve-wracking, but good practice,” Shah said. Aside from shopping websites, chatbots could be used by public government agencies to help guide citizens to needed resources like trash pick-up schedules, licensing requirements, publicly available digital records or officials who can help solve problems. Beyond the chatbot project, Deep Patel – also a Computer Science graduate student in CEAS – is working on a related STILE project to explore how different web technologies can be used to make machine learning, artificial intelligence, data analysis, and similar systems available through interactive displays on the web. The STILE program is part of CTG UAlbany – formerly named the Center for Technology in Government – which is a research institute that works with governments worldwide transforming public services through innovations in technology, policy and management. STILE brings together students, faculty, and researchers to help government agencies find solutions to pressing public problems. The program provides governments with research, development, testing, and evaluation expertise while providing students with experiential learning. 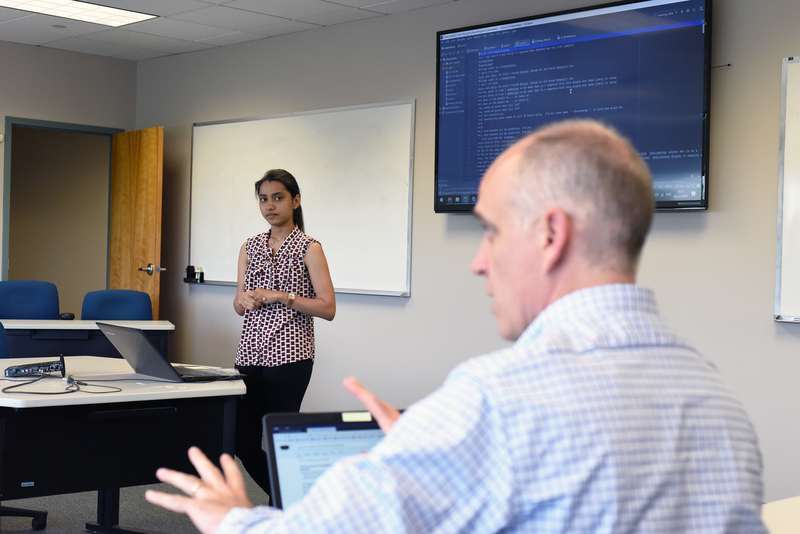 The chatbot and advanced web technologies development projects are part of the third summer of STILE projects CTG UAlbany has hosted. Last summer students developed open data visualization techniques with the New York State Department of Health (NYSDOH). Students have also worked on ultra wideband technology as applied to public transportation.